LION, it is said, used once to fly, and at that time nothing could live before him. As he was unwilling that the bones of what he caught should be broken into pieces, he made a pair of White Crows watch the bones, leaving them behind at the kraal whilst he went a-hunting. Lion, lying in wait (for game), wanted to fly up, but found he could not fly. Then he got angry, thinking that at the kraal something was wrong, and returned home. When he arrived, he asked, “What have you done that I cannot fly?” Then they answered and said, “Someone came here, broke the bones into pieces, and said, ‘If he want me, he may look for me at yonder pool!”‘ Lion went, and arrived while Frog was sitting at the water’s edge, and he tried to creep stealthily upon him. When he was about to get hold of him, Frog said, “Ho!” and, diving, went to the other side of the pool, and sat there. 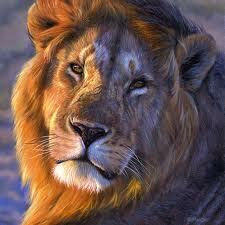 Lion pursued him; but as he could not catch him he returned home.